New York Cosmos Defender Rovérsio and Midfielder Walter Restrepo (pictured) were named to the NASL Team of the Week for Week 3 on Wednesday. Both have been huge parts to the Cosmos 2-1 record so far, putting in outstanding performances and making some huge contributions to the club. DEF: Rauwshan McKenzie (Atlanta Silverbacks) – The Atlanta Silverbacks may have been on the road at WakeMed Soccer Park, a venue where they have particularly struggled over the years, but the tide could be turning. The Silverbacks have now won back-to-back games in Cary, N.C., and defender Rauwshan McKenzie led the defensive charge this time around. The former Michigan State standout was strong all night, helping the Silverbacks’ back line limit the Carolina RailHawks to very few chances. Atlanta was nearly able to keep a clean sheet, but a late goal from Blake Wagner meant they had to settle for a 2-1 victory. DEF: Erick Norales (Indy Eleven) – After his team conceded a goal early in the second half to go down 1-0, Honduran international Erick Norales notched the equalizer 12 minutes later. The defender, who had a strong game in the back as well, nodded in Dylan Mares’ corner kick at the back post in Indy’s 2-1 road win over the Scorpions. DEF: Rovérsio (New York Cosmos) – Playing against a long-standing rival in front of a sellout crowd in New York, the Tampa Bay Rowdies rarely looked like an attacking threat. A large part of that was due to the New York Cosmos’ defensive work, which on Saturday night was led by Brazilian center back Rovérsio. The former Real Betis defender helped limit the Rowdies to just two shots on goal in the 2-0 shutout win. DEF: Rafael Alves (Ottawa Fury FC) – Minnesota United FC brought plenty of firepower to TD Place, but Fury FC’s defense stood tall. Thanks to efforts like that of towering center back Rafael Alves, the Loons were only able to get two shots on target, and neither managed to trouble Fury FC goalkeeper Romuald Pesier. It was a sterling display from the Brazilian center back, as Fury FC defeated Minnesota, 1-0 – a result that represented their first-ever win against the defending Spring Season Champions. MID: Sainey Nyassi (FC Edmonton) – In FC Edmonton’s first win of the season, Sainey Nyassi turned in a Man-of-the-Match performance. He first assisted on Ritchie Jones’ opener after an impressive dribbling run, and later in the first half, the Gambian international drew a penalty – only to see teammate Frank Jonke unable to convert it. After the Eddies found themselves down a goal to the Fort Lauderdale Strikers late in the match, the Player of the Week smashed home a rebound to draw the match level in a game the Eddies would eventually go on to win. MID: Sergio Peña (Indy Eleven) – Indy Eleven fought back to even the score in San Antonio and seemed destined for their third successive draw, but that’s when Sergio Peña stepped in with a moment of pure genius. The Honduran, who is never shy at pulling the trigger on shots from distance, chested down a headed pass from Wojciech Wojcik, let the ball bounce, and struck the ball cleanly and powerfully from 45 yards out for a stunning winner just before the final whistle. 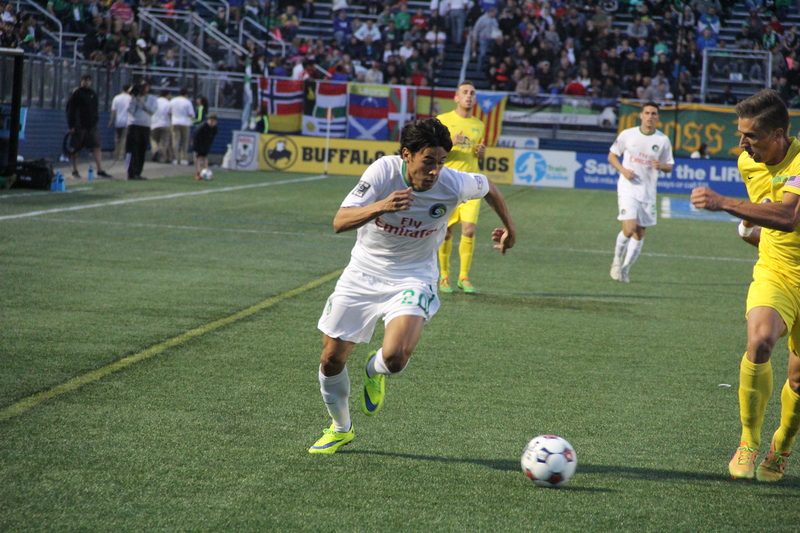 MID: Walter Restrepo (New York Cosmos) – Playing on the wing, Walter Restrepo was dynamic throughout his 90-minute shift against the Rowdies, playing a part in both Cosmos goals. Early in the first half, one of his crosses was met by forward Mads Stokkelien, whose header came off the arm of Tampa Bay defender Darnell King to draw a penalty. Marcos Senna stepped up to convert the spot kick just a minute later. In the second half, the Colombian midfielder played a low cross through the penalty area to fellow midfielder Leo Fernandez, who made no mistake from close range to give New York a two-goal lead that they wouldn’t relinquish. FWD: Tom Heinemann (Ottawa Fury FC) – Minnesota United FC’s back line could use a break from Tom Heinemann for a while. The American forward put the Loons’ defense under pressure throughout his 69 minutes on the pitch. Just before he was substituted, Heinemann got the goal that he deserved, beating several Untied defenders and coolly slotting the ball past goalkeeper Sammy Ndjock for what would eventually stand as the winner. FWD: Shaka Bangura (Atlanta Silverbacks) – After playing to a scoreless first half in Carolina, it didn’t take much time for Atlanta to get on the scoresheet in the second stanza. Shaka Bangura’s shot from the top of the 18-yard box four minutes after halftime found the back of the net to set the Silverbacks on their way to their first victory of the 2015 Spring Season. FWD: Tomi Ameobi (FC Edmonton) – While not involved in the match until the latter stages, Eddies forward Tomi Ameobi left about as good of an impression as he could have. Entering with 17 minutes to go, the English forward instantly lifted FC Edmonton’s spirits. After teammate Sainey Nyassi scored the equalizer, Ameobi was left unmarked at the back post to head home a Lance Laing cross in the 80th minute. The goal gave his team a 3-2 lead – a score that would stand to give the Eddies a thrilling comeback victory over the Strikers.